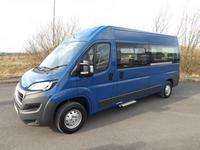 New Peugeot Boxer CanDrive Flexi 17 seat Minibus in Clipper Blue paint finish. Also available in Dragoon Blue. Designed and custom built for the education sector, particularly for pupils aged 11 to 18 years. The CanDrive Flexi 17 Seater is IVA tested, has a flexible seat arrangement and extra payload. It may be driven on a standard B driving licence, no expensive and time consuming D1 licence training required (conditions apply*). New vehicles can be first registered as a minibus for schools and charities. The base Peugeot vehicle features a 2.0 BlueHDi Euro 6 diesel engine and 6 speed manual transmission, meaning excellent performance combined with impressive fuel economy and low emissions. Heated electric wing mirrors with 4-way adjustment, electric windows, Bluetooth connectivity, DAB radio, remote central locking, height adjustable driver’s seat and steering wheel are standard equipment. Manual side step below sliding side door, along with our twin full-height handrail system and courtesy panel, to aid embarking and disembarking. Purchase this Peugeot Boxer Minibus from £24,995 + VAT or lease from as little as £14 + VAT per day over 5 years. Still wondering whether to buy or lease a new minibus? Our unique Try Before You Buy and Try Before You Lease deals let your establishment experience a minibus for up to 6 months, with no long-term commitment or obligation. For an affordable £13 per day we will match you with an ideal minibus so you can see how much convenience it offers, saving you countless hours spent organising transport and potentially reducing your costs.